Gambling has become one of the most popular entertainments for many people around the world. Casino games are interesting and exciting and modern casinos allow players to feel astonished about amazing architecture, interior designs and customer service. Players can get satisfaction from the games they play and services they are offered. 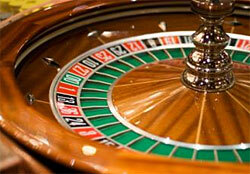 Among the great variety of casino games of chance roulette remains the most popular one. The easy and straightforward rules of roulette allow players to learn them quickly and enjoy the gaming process. This game has a very interesting roulette history as its roots go back to 18th century. During the course of its development many variations of the game appeared but the most popular are European and American roulette. European roulette is the favorite variation of roulette due to the high winning probabilities comparing to American version. European roulette wheel has 36 numbered slots and one zero slot (0). That is why this variant of the game is also called Single Zero Roulette. The numbers on the wheel are disposed in a random order which do not influence the outcomes of the game. Due to the fact that there is only one zero slot European roulette has low house edge (2,70%) and high odds. The rules of the game are the same as in American roulette. The table layout in European version is considered to be more practical. American roulette is a tricky version of roulette as it is more favorable for casino owner than for players. American roulette wheel has 36 numbered slots disposed in pairs opposite one another and two zero slots: single (0) and double (00) zero. The latter is crucial factor for the high house edge (5,26%). The numbers disposition does not influence the outcomes of the game. The rules of American roulette are the same as in European version. It is very easy to learn how to place bets in roulette and they do not differ in the two main variations. The only difference is that players have the additional type of bet in American roulette which is called Top Line bet and it covers 5 numbers 0, 00, 1, 2 and 3 with 6:1 payout.